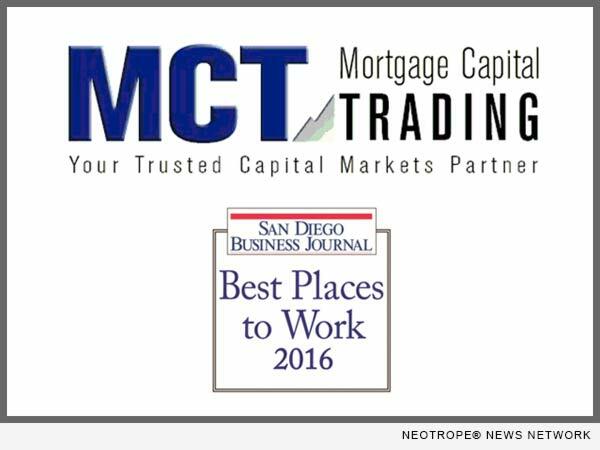 SAN DIEGO, Calif. /California Newswire/ — Mortgage Capital Trading, Inc. (MCT), a recognized leader in mortgage risk management providing pipeline hedging, best-execution loan sales, and centralized lock desk services, announced that it has been named Best Places to Work by the San Diego Business Journal (SDBJ) for the fifth straight year. MCT was ranked number 13 in the medium-sized company category (50 – 249 U.S. employees) and is one of only a hundred companies being recognized in all four categories. The award is designed to identify, recognize and honor the best places of employment in San Diego that benefit the county’s economy, workforce and local businesses. Founded in 2001 and headquartered in downtown San Diego, MCT has grown from a pipeline hedging services specialist into a fully-integrated provider of capital markets services and software. MCT’s recently expanded office overlooks PetCo Park. The company also has offices in Flower Mound, Texas and and Bala Cynwyd, Pennsylvania. MCT employs over 80 people and continues to grow. The SDBJ puts companies that applied for the award through an extensive evaluation process that includes a detailed analysis of company workplace policies and practices along with a comprehensive employee survey. The combined scores determined the top companies and the final rankings. The list-making companies were honored at an awards ceremony hosted by the SDBJ on August 11 with nearly 500 attendees. A special issue of the SDBJ profiled all of the companies selected in the publication’s August 22 issue. More information on the SDBJ’s Best Places to Work in San Diego program can be found at http://www.BestPlacestoWorkSD.com.